Copyright 1988 The Authors - The University is continuing to endeavour to trace the copyright owners and in the meantime this item has been reproduced here in good faith. We would be pleased to hear from the copyright owners. The stepped cline from green to glaucous morphs of E. urnigera with increasing altitude on Mt. Wellington, Tasmania, is one of the classic examples of clines in forest trees (Barber and Jackson 1957; Endler 1977). 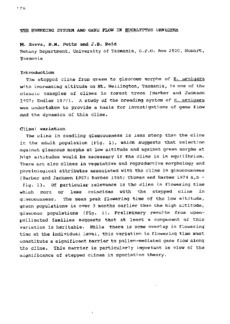 A study of the breeding system of E. urnigera was undertaken to provide a basis for investigations of gene flow and the dynamics of this cline.